The Colorado Springs Manufacturing Task Force and the Coalition for a Prosperous America invited conservative Christians both Republicans and Democrat to discuss US Trade initiatives Tuesday May 20th, 2008. The title of the program was, Our Economy-Trade and Economic Morality: Where Must We Stand? And members of the community were invited to include all 5th Congressional Candidates from Colorado Springs. On the Republican side we had Jeff Crank who received a great loud applause from across the room as he eloquently spoke about the importance of the Trade issue especially in regards to community small business ability to co-exist with bigger business and local job growth. Democrat 5th Congressional runner Hal Bidlack also had excellent humble comments in regard to Trade policies, and answered interesting questions from the audience. Terry Stevenson a cattle rancher from Wyoming who has a degree in philosophy and theology sat between the Candidates. Mr. Stevenson also gave a great talk in which he summarized the basics on Ethics, Trade and Economic Morality especially as that started by our Founding Fathers who had experience dealing with prior Whims of Kings or Ministers that often would just take other’s property or create abusive monopolies. Our Nation he went on to say was founded on ethical and moral principles and by this experience ensured our right to private property and allowed healthy free enterprise and a great form of Capitalism unlike no other around the World. This is one of a series of talks, debates and public forums on Trade here in the city of Colorado Springs by the presenters. Like a famous quote by Woody Allen that said, “80% of Success is Showing Up”, so we hope many more attend and show up to future presentations on the Trade issue for it affects many aspects of our lives, business and economic success to include the keeping our Sovereignty as an independent Constitutional Republic. The Trade subject could be simple yet also is very complex for others argue that if we had true sound money and if our Congress was the one to truly issue our currency as our Constitution states and not international bankers then Trade would not have been the problem as we face today taking us further into Internationalists bylaws or entanglements. This is one of the reasons that true monetary reform has been discussed this election to include proposed new Legislation like the “Honest Money Act” by Congressman Ron Paul of Texas. Grass roots community groups such as prosperous America.org and others like those for sound monetary and banking reform are trying to discuss the issues so that we can continue to Trade without losing our Christian principles, Rule of Law, Nation of Checks and balances (Representative of the people) and not one in the future of un-elected bureaucrats or foreign entities ruling over us and our children. The power of the money interests will eclipse the power of our own government if we continue on this path. The founders not only warned against the tyranny of the monied powers, they also counseled “commerce with all nations, entanglements with none.” The trade agreements that are extending “international economic integration” are dangerously entangling pacts that do little to spread genuine democracy and true free enterprise. Later we could post more information written by David W. Frangel on globalization and our other founding principles for further research into the subject. We wish to thank the Candidates for taking time out from their busy campaign schedules to sit and visit with the public and other business leaders. 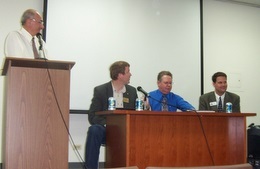 Note, In photo from left to right is David W. Frengel, Democrat Candidate Hal Bidlack, Terry Stevenson, and Republican Candidate Jeff Crank. This list was courtesy of the local GOP office so that everyone could read, review and be informed with all the condensed resolutions from submissions of all precincts during caucus and presented at County Assembly. Your voices and concerns have been heard, reviewed and all submissions documented on file. Thanks for your concerns and participation during your caucus across the State, County Assembly and to all volunteers. Resolution #2 Second Amendment II. illness, intellectual capacity, or physical ability; and opposes the use of public revenues for abortion and for the cloning of, or destructive experimentation on, any human being, from the single-celled ~!age until natural death. research is unethical, unsafe, and unnecessary –opposes the use of state or federal monies to fund it. protected from that moment on. marriage in the United States as consisting only of the union of one man and one woman. which commits elected Republicans to support a balanced federal budget. inserting earmarks into the federal budget. who inserts earmarks into the federal budget to release all information about those earmarks. franking privileges only for personal handwritten correspondence between themselves and their constituents. THEREFORE be it resolved that Congress retain the federal law prohibiting the death tax. and must fully enforce existing immigration laws. fair share of the transportation dollars necessary to maintain and expand our economic infrastructure. policy to develop all energy resources, including RoanPlateau,off shoredrilling, and ANWR. industry or on private citizens in an attempt to reduce energy or redistribute wealth. States Congressional office-holders to a maximum of 12 years. . .
home-school movement toward academic excellence. THEREFORE be it resolved that prayer or a moment of silence be included In each school day. health insurance products which are legal in any other state in the Union. organizations or trade deals that infringe upon our country’s freedom and independence. Court ruling in order to restore the protection of individual property rights. Delivery System from the Pueblo Reservoir. Resolution #29 Proof of Citizenshipto Vote . proof-of-citizenship when a person registers to vote in our State. union or to pay any dues, fee, or assessment to a labor union. his retirement from the Senate will not mean his retirement from the great causes for which he has already labored long and hard. should revoke Governor Ritter’s executive order pertaining to “employee partnerships” in state government. Assembly to freeze mill levy rates and also calls for a referendum of Colorado voters on this question. development and recording of caucus documents. assembly process since it is the most effective way to secure our party’s conservative values.